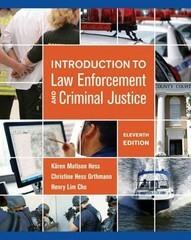 Introduction to Law Enforcement and Criminal Justice 11 Edition This comprehensive and practical book covers law enforcement and the criminal justice system as a whole (including courts, corrections, and juvenile justice) in one easy-to-understand volume. You'll find a realistic and relevant "boots on the street" perspective, real world examples in every chapter, and up-to-date information on a wide range of today's hottest topics, the Towards Zero Death (TZD) traffic-safety initiative, rapid DNA profiling, CompStat Plus, warrantless searches of vehicles, hacktivism, iPads/tablets and geolocation "pinging"communication devices in the field. joint terrorism task forces (JTTFs), and more.